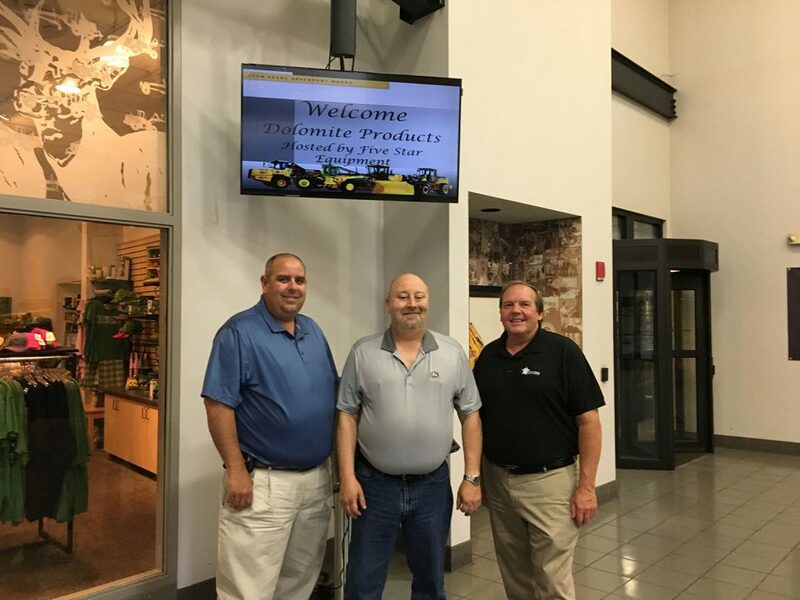 Five Star Equipment recently hosted Dolomite Products of Walworth, NY at the John Deere Davenport Works Gold Key Tour in Davenport, IA. Dolomite Products is the first Five Star Equipment customer to purchase the innovative John Deere 944K Hybrid Wheel Loader, the largest wheel loader in the Deere fleet. In addition to the Deere 944K, Dolomite Products also purchased a Deere 844K-III Wheel Loader. During the trip, the group from Dolomite Products and Five Star Equipment toured the Davenport production facility to see the finishing touches being put on the 944K. John Deere officials presented Dolomite Products with a special plaque and the commemorative John Deere Gold Key. “We’ve enjoyed working with Harry Gorrell and the team at Dolomite on this equipment order. What better way for us to thank them for being such a great customer than to take them to John Deere’s production facility to see their 944K as it rolls off the line? It’s an impressive facility and everyone from Deere was very welcoming to us,” says Dave Johnson, General Manager of Five Star Equipment’s Rochester branch. John Deere gave a warm welcome to Dolomite Products and Five Star Equipment. Left to right: Dave Johnson, Five Star Equipment; Harry Gorrell, Dolomite Products and Kenn Baker, Five Star Equipment.